American Tourister: 30-70% of American Tourister backpacks, under seat carry-on & a huge variety of other bags. Sale ends January 22, 2019. Samsonite: Weekly Steal! Great deals on select Samsonite bags! Offer ends January 23, 2019. Southwest Airlines: Fare sale, with fares as low as $69. Offer ends January 24, 2019. Long John Silvers: Get $2 off a Variety Platter or $5 off a family meal with these coupons (coupons in link) good through January 27, 2019. Modoker Convertible Carry-On Garment Bag: Regularly $43.99, just $32.99 with coupon code MODOKERS. Offer ends January 27, 2019. Red Lobster: Has a lunch coupon is good for $3 off two lunch entrees or $1.50 off a single entree. Their dinner coupon is good for $4 off two dinners or $2 off a single dinner entree. Coupons in link. Offer ends January 27, 2019. 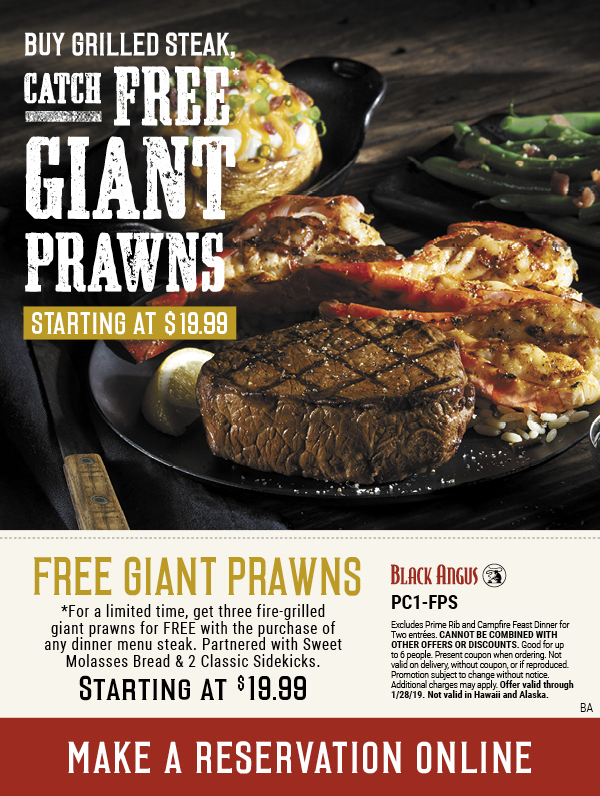 Black Angus: Buy a steak dinner and get free Giant Prawns with this Black Angus Steakhouse coupon (coupon in link). Offer ends January 28, 2019. Contiki: Save 15% off 12 favorite trips workwide. For U.S. customers only. Offer ends January 31 2019. Previous Previous post: The World’s First Entirely Vegan Hotel Suite Is Now Taking Reservations – And You Can Use Points! Next Next post: What Happens When Everyone Is Elite?